Shopping Spree! Jessica Simpson was all smiles while leaving the Fred Segal department store in Los Angeles after some retail therapy on Wednesday afternoon. The mom-to-be, who carried her purse and some shopping bags, was followed by an associate with more shopping bags. This time around we have seen Jessica go for comfort over fashion. Her favorite piece appears to be the belly hugging black tank and stretch pants. She also traded her heels in for flats a long time ago. Due in May with a boy, the singer has been busy prepping for baby and promoting her various endeavours. On Sunday, however, she relaxed with friends at her Tom Sawyer-themed baby shower, which was held at Los Angeles’ Hotel Bel-Air’s pond. 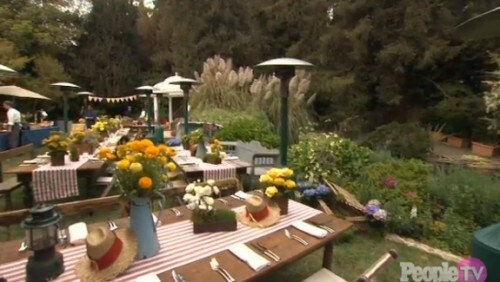 Yellow flowers and banjo music helped set the vibe, and her 48 guests were served Champagne with fresh blueberries in vintage baby bottles with custom straws. Goodie bags included blue nail polish, lip gloss and condoms — a reminder of Simpson’s surprise over the unplanned pregnancy. And children were treated to a grilled cheese station while guests enjoyed Southern comfort food.